Touring Israel in 1973 with her family, a young Jewish woman stands in the Garden of Gethsemane. There, overlooking Jerusalem, with monks chanting nearby in the room reputed to be the site of the Last Supper, she quietly experiences a spontaneous spiritual revelation: “It all really happened. Jesus lived; His story is real and it is important to my life.” She feels an overwhelming, awe-inspiring experience of the presence of God. In the following months, as she begins her freshman year at college, she meets Jews who believe in Jesus, yet still identify as Jews. Soon, she counts herself among them. This was the first of a series of “heresies” that later lead her to explore the world’s rich trove of spiritual practices and religions, immersing her in many mystical experiences. Today, an ordained interfaith minister and Spirit-directed healer, she reflects on her relationship to her deep Jewish roots. What kind of Jewish culture did you grow up in? I was not raised religiously. I come from a very strong cultural tradition. My grandparents emigrated from Russia, where in revolutionary times there were Jews who felt religion kept them oppressed, so they abandoned the religious orthodoxy but wanted to keep their rich Jewish cultural heritage. In coming to America that cultural expression split off into many streams. One of those was the milieu in which I grew up, the labor and intellectual movements of the Workmen’s Circle and Sholem Aleichem Folk Institute. So an attribute of what it means to be Jewish is to have an intellectual bent, a focus on education, information and analysis. What else? What are the transmissions that you value from your Jewish ancestral connection and that have been helpful and you want to pass on? Many things. The transmission, the cultural inform, has the light side and the shadow. The light is education. The shadow is the culture of suffering, which I have worked within myself to put an end to in my generation. Questioning is fundamental to Jewish discourse. That’s part of the rabbinic, Talmudic stream, even if you don’t know that is where it comes from: the discussion, the debate, Jewish lawyers! Jews aren’t afraid to argue with God, or with anyone else. So what is it about Jews and suffering? What have you learned about that? When I was eight years old, at the same time God was emerging in my life, the local Community Center had a Holocaust exhibit. All of it: the pictures of mass graves, the bar of soap, the lampshade, the camps. That imprinted on me deeply. I never forgot that. In Israel, there are memorials everywhere you go, and I visited all of them by the time I was 16. I never watched “Schindler’s List.” I never went to the Holocaust Museum. I’m not the person who needs that education. I was raised and taught by people who lived that. I heard all those stories first hand. That’s all part of the suffering legacy and there is good reason for that historically. For myself, there were…. memorable instances where I saw the meme of suffering not as just my personal experience, but like a cultural entity living through me, and I was then able to transform it. Once was when I was in a two-year depression after a break-up. A friend’s daughter said about me, when it was long past time for me to snap out of it, “There’s six million Jews suffering in that body!” And when she said it, I got that part of my response to my personal loss was the archetype of suffering expressing itself in me with a life of its own. That helped me climb out of my funk. Ordained as an Interfaith Minister under the auspices of The New Seminary, Rev. Nettie M. Spiwack has thousands of hours of study and practice in a wide variety of spiritual and transformational disciplines. 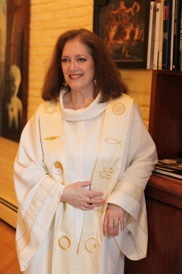 Interest in multiple spiritual paths led to her commitment to interfaith work and perspectives. Rev. Nettie is an ordained Spirit-Directed Healer, and for six years studied with noted healer and mystic Rev. Ron Roth Ph.D., as well as engaging in doctoral studies with C. Norman Shealy, MD. She has led people on healing pilgrimages to India, Israel and to Brazil to the healing house of John of God, where, when there, she serves as a Casa medium. Her ministerial work focuses on bringing the direct experience of Divine healing power through group healing services, satsangs, and educational programs. Rev. Nettie’s primary vehicle for connecting with Divine Spirit is devotional music and chant. She has written, recorded and performed devotional music, and had the honor of performing with a group in India for Sri Sathya Sai Baba.